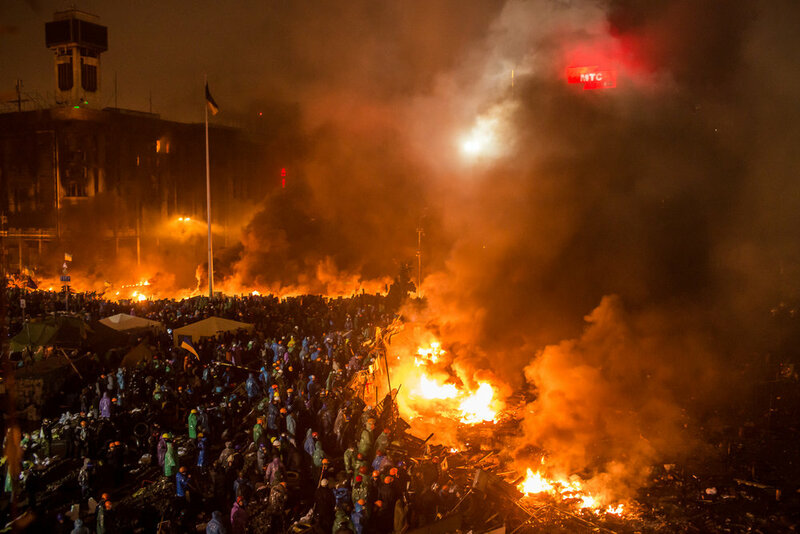 As winter settled over Ukraine in late 2013, Kiev exploded into crisis. President Viktor Yanukovych announced that he would abandon a promised trade and partnership agreement with the European Union in favor of support from Russia. Thousands of people took to the streets in protest over a culture of official corruption which they feared would only deepen amid closer ties to Russia. 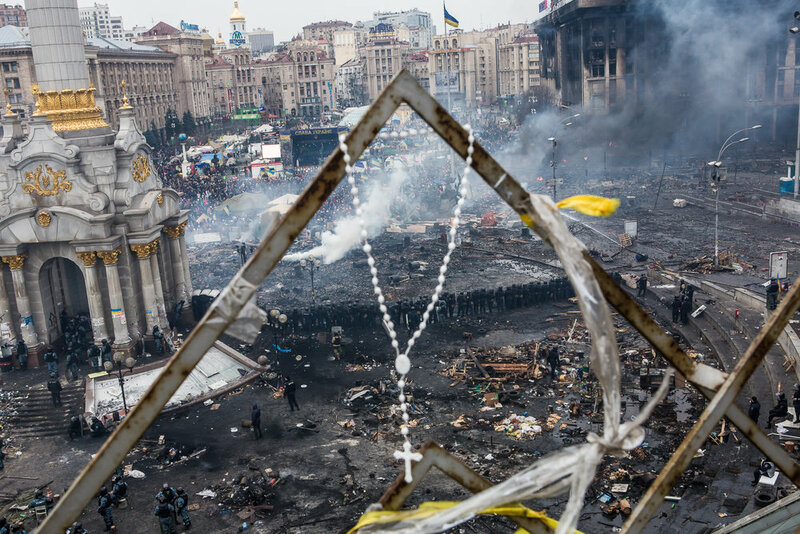 For nearly two months the occupation of Independence Square—the “Maidan”—remained largely peaceful. But beginning in late January, heightened violence by police brought an aggressive response from protesters, and they fought back from behind barricades of burning tires with Molotov cocktails and rocks launched by massive slingshots. With the crisis reaching new depths in late February, President Yanukovych lashed out and over 80 people were killed when government snipers opened fire on protesters. Two days later, Yanukovych was forced out of office amid evaporating political support. Anti-government protesters walk amid debris and flames near the perimeter of Independence Square, known as Maidan, on February 19, 2014 in Kiev, Ukraine. After several weeks of calm, violence has again flared between police and anti-government protesters, who are calling for the ouster of President Viktor Yanukovych over corruption and an abandoned trade agreement with the European Union. Police block the road near the Ukrainian Cabinet of Ministers building on January 24, 2014 in Kiev, Ukraine. After two months of primarily peaceful anti-government protests in the city center, new laws meant to end the protest movement have sparked violent clashes in recent days. Anti-government protesters burn tires during clashes with police on Hrushevskoho Street near Dynamo stadium on January 25, 2014 in Kiev, Ukraine. After two months of primarily peaceful anti-government protests in the city center, new laws meant to end the protest movement have sparked violent clashes in recent days. Anti-government protesters sleep on the floor of the occupied Kiev City Hall on December 7, 2013 in Kiev, Ukraine. Thousands of people have been protesting against the government since a decision by Ukrainian president Viktor Yanukovych to suspend a trade and partnership agreement with the European Union in favor of incentives from Russia. Anti-government protesters lock arms to block access to a street that leads to the Ukrainian parliament building, the site of a rally held by the ruling Party of Regions in support of the government and Ukrainian president Viktor Yanukovych, on December 8, 2013 in Kiev, Ukraine. Thousands of people have been protesting against the government since a decision by President Yanukovych to suspend a trade and partnership agreement with the European Union in favor of incentives from Russia. Anti-government protesters throw Molotov cocktails at police during clashes on Hrushevskoho Street near Dynamo stadium on January 25, 2014 in Kiev, Ukraine. After two months of primarily peaceful anti-government protests in the city center, new laws meant to end the protest movement have sparked violent clashes in recent days. Police officers block the street near the Cabinet of Ministers building on January 24, 2014 in Kiev, Ukraine. After two months of primarily peaceful anti-government protests in the city center, new laws meant to end the protest movement have sparked violent clashes in recent days. Anti-government protesters stand behind a line of burning tires and debris on Independence Square on February 19, 2014 in Kiev, Ukraine. After several weeks of calm, violence has again flared between anti-government protesters and police as the Ukrainian parliament is meant to take up the question of whether to revert to the country's 2004 constitution. Anti-government protesters walk among burned buses on Hrushevskoho Street near Dynamo stadium on January 25, 2014 in Kiev, Ukraine. After two months of primarily peaceful anti-government protests in the city center, new laws meant to end the protest movement have sparked violent clashes in recent days. 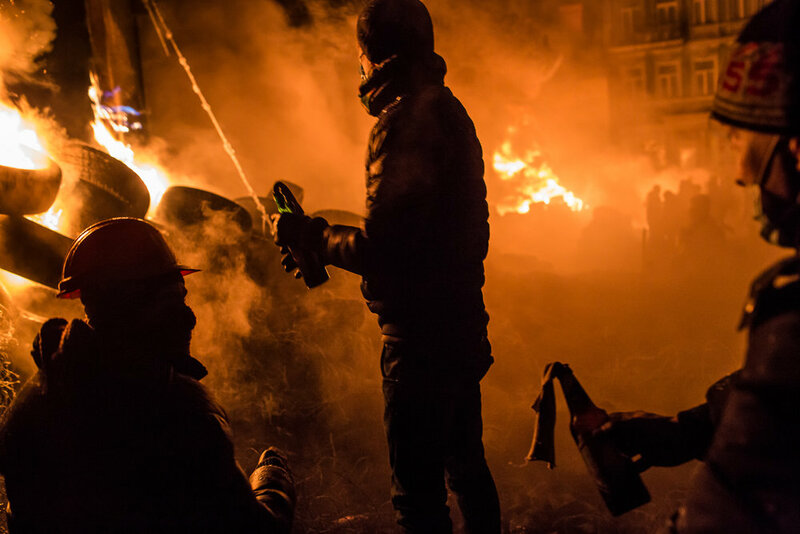 Anti-government protesters prepare to throw Molotov cocktails during clashes with police on Hrushevskoho Street near Dynamo stadium on January 25, 2014 in Kiev, Ukraine. After two months of primarily peaceful anti-government protests in the city center, new laws meant to end the protest movement have sparked violent clashes in recent days. 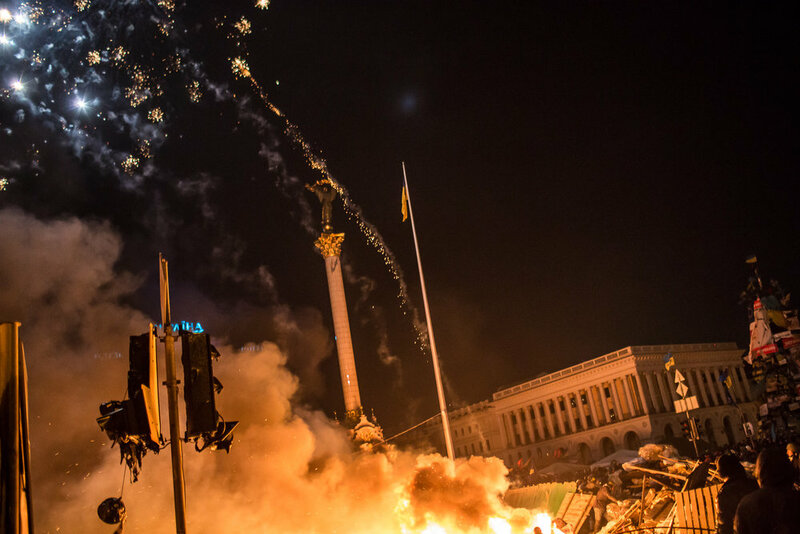 Fireworks fly over Independence Square, known as Maidan, during clashes in the early hours of on February 19, 2014 in Kiev, Ukraine. After several weeks of calm, violence has again flared between police and anti-government protesters, who are calling for the ouster of President Viktor Yanukovych over corruption and an abandoned trade agreement with the European Union. 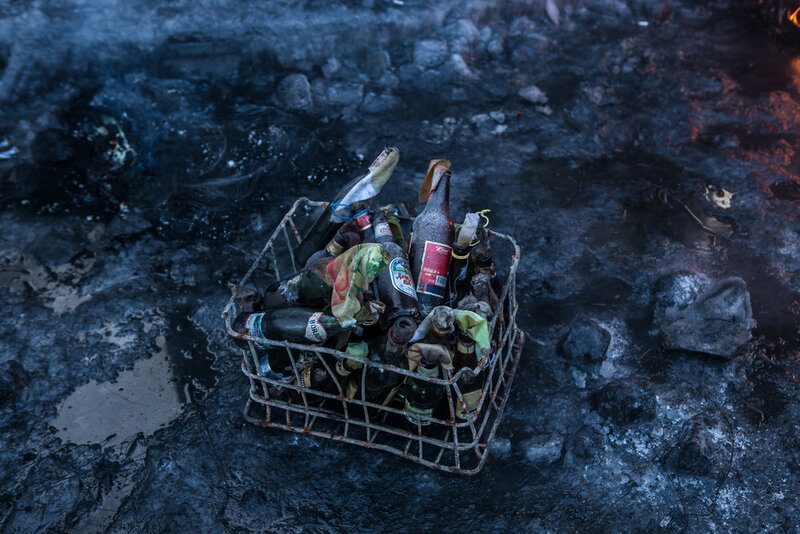 Incendiary projectiles are ready to be used by anti-government protesters near Dynamo Stadium on January 24, 2014 in Kiev, Ukraine. After two months of primarily peaceful anti-government protests in the city center, new laws meant to end the protest movement have sparked violent clashes in recent days. An anti-government protester throws a Molotov cocktail during clashes with police on Hrushevskoho Street near Dynamo stadium on January 25, 2014 in Kiev, Ukraine. After two months of primarily peaceful anti-government protests in the city center, new laws meant to end the protest movement have sparked violent clashes in recent days. Taras Chumak, 20, from the town of Ivano-Frankivsk, rests inside the International Center of Culture and Arts, which is occupied by anti-government protesters, on December 8, 2013 in Kiev, Ukraine. Thousands of people have been protesting against the government since a decision by Ukrainian president Viktor Yanukovych to suspend a trade and partnership agreement with the European Union in favor of incentives from Russia. Berkut riot police shoot rubber bullets toward anti-government protesters on Independence Square on February 19, 2014 in Kiev, Ukraine. After several weeks of calm, violence has again flared between anti-government protesters and police as the Ukrainian parliament is meant to take up the question of whether to revert to the country's 2004 constitution. A priest blesses a gravely wounded anti-government protester after medics stopped trying to save him in the lobby of the Hotel Ukraine, which has been converted to a medical clinic and makeshift morgue, on February 20, 2014 in Kiev, Ukraine. After several weeks of calm, violence has again flared between anti-government protesters and police, with dozens killed. 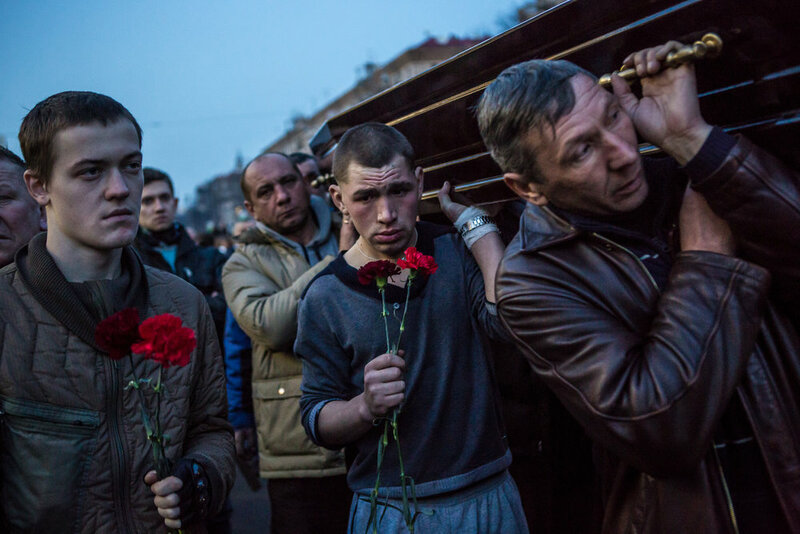 Men carry a casket containing the body of an anti-government protester killed in clashes with police from Independence Square on February 21, 2014 in Kiev, Ukraine. After a week that saw new levels of violence, with dozens killed, opposition and government representatives reached an agreement intended to resolve the crisis. A person wrapped in a Ukrainian flag watches the sun set over Independence Square on December 4, 2013 in Kiev, Ukraine. Thousands of people have been protesting against the government since a decision by Ukrainian president Viktor Yanukovych to suspend a trade and partnership agreement with the European Union in favor of incentives from Russia. Police form a barrier in Independence Square on February 19, 2014 in Kiev, Ukraine. After several weeks of calm, violence has again flared between anti-government protesters and police as the Ukrainian parliament is meant to take up the question of whether to revert to the country's 2004 constitution.